High asphalt content mix designs like Stone Matrix Asphalt (SMA) and Open Grade Friction Courses (OGFC or PFC) require careful mixing and placement. In order to prevent the asphalt from draining down over the aggregate, a small percentage of cellulose fiber is used to thicken and stabilize the mix. The cellulose functions by expanding and interlocking to form a matrix that holds the asphalt in place and prevents migration during production, transportation and compaction of the mix. 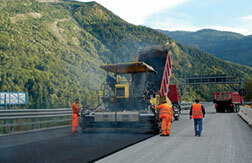 CreaFill offers both loose and pelletized fibers for road stabilization. Please call or e-mail for a recommendation for the most efficient dosing method for your drum or batch asphalt plant. Pellets are extremely efficient to ship, easily stored at the plant and require less manpower to dose and monitor. to meet the needs of clients.